Beginning in June 2012, drug task force agents tracked 78 occasions when people who had recently purchased pseudoephedrine arrived at Tena Logan’s residence in Loxa, Ill., according to a written statement by FBI task force officer Scott Standerfer, in the case against Logan. 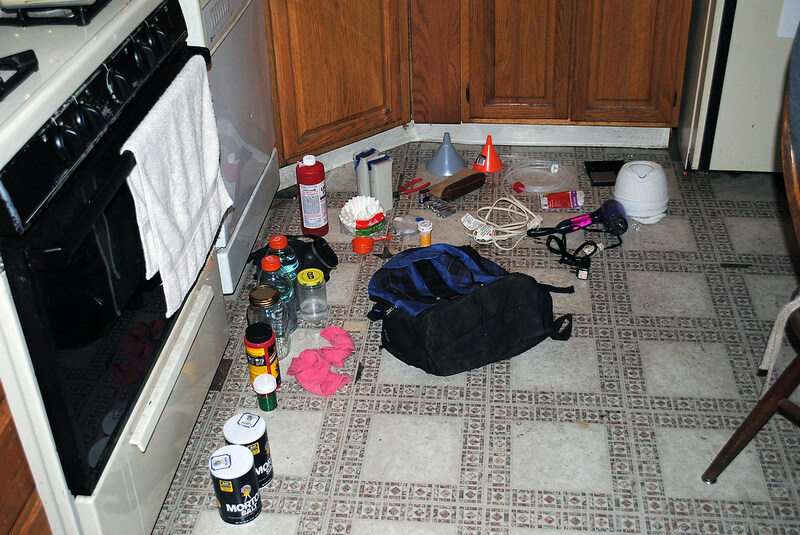 A meth lab photo provided by the East Central Illinois Task Force based in Mattoon, Ill.
Logan, 50, and five alleged co-conspirators gathered about 421 grams of pseudoephedrine pills from April 2012 to December 2012. The maximum possible yield for that amount of pseudoephedrine is 387 grams of meth, Standerfer said. 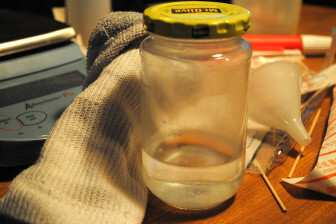 A single gram of meth is often enough to keep an addict satisfied for a day, according to agents from the Illinois State Police’s Zone 5 Meth Response Team. The actual amount of meth that could have been produced varies. 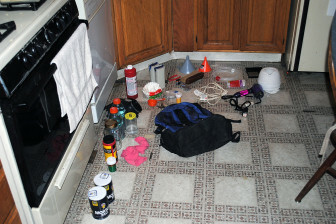 “However, based on my experience and training 421 grams of pseudoephedrine would yield no less that 210 grams of methamphetamine, easily greater than 50 grams of methamphetamine,” Standerfer said in the statement from the Logan case. In December 2012, Logan, her husband Paul “Bear” Logan and four others were indicted for running a meth ring out of their Coles County residence at 6790 Stockton Road in Loxa. Court files showed that 15 different people purchased pseudoephedrine during those 78 occasions between June and December 2012. In 60 of the 78 occasions, the person who made the purchase arrived at the Logan residence within an hour of buying the pseudoephedrine, including the afternoon of Thanksgiving Day. On March 7, 2013, Logan pleaded guilty to both conspiring to manufacture 50 grams or more of meth and possessing it with intent to distribute. She was then sentenced to 15 years in prison on June 28. Logan is currently being held in the Federal Medical Center in Lexington, Ky. Her husband and the four others allegedly involved with the conspiracy — Tammy Britt, Fred Leonard, Robert Jeffrey Leonard and Floyd Curtner — await sentencing. Although no evidence exists for Paul Logan ever purchasing pseudoephedrine during the time of the conspiracy, he has pleaded guilty to the same charges as his wife. He and Robert Jeffrey Leonard were scheduled for sentencing this month. Britt, Fred Leonard and Robert Jeffrey Leonard have also pleaded guilty to their conspiracy charges. Curtner’s case is still in pretrial.